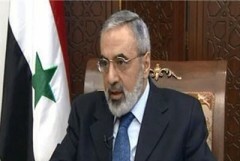 In an interview on the Lebanese al-Manar TV on Monday, Minister al-Zoubi said that there are clashes in specific areas in Damascus Countryside and attempts by the terrorist organizations to achieve any kind of progress, adding that the life is normal in Damascus. He highlighted that Syria realizes the nature of the confront with the enemy plot and is working on protecting the state institutions and infrastructure. He pointed out that the suffering of the Syrians in securing some materials is caused by the acts of the terrorist groups which are attacking the vehicles transporting wheat, petroleum and other goods. He noted that the terrorist bombings in residential areas aim at terrorizing people, embarrassing the security and military system and alluding the public opinion to the idea that they can do whatever they want whenever they want, adding that these acts are part of media and military policy for those sides. Minister al-Zoubi added that there are intelligence agencies operating on the Syrian soil since the beginning of the crisis, embodied in the existence of advanced equipment and technologies among the terrorist groups and in high-tech sabotage acts committed by the terrorists. He considered the Turkish talks on Syrian threats against Turkey as naïve, adding that Syria never threatened, attacked or interfered in any neighboring countries’ affairs. “Deployment of the Patriot missiles doesn’t target Syria only, it is part of radars and early warning systems established by the US with cooperation with the government of Recep Tayyip Erdogan. These systems target Iran, Syria, Cyprus, Greece, Egypt and other countries,” he noted. Al-Zoubi stressed the need to adhering to Geneva statement and the initiative of the former UN envoy Kofi Annan, that are based on respecting national independence and not meddling in the countries’ internal affairs. Minister al-Zoubi said Russia’s stance towards Syria is “firm, not contradicted, rather clear and frank” as it shows keenness on the interest of Syrian state and people. ” Russia also rejects any foreign interference in Syria’s internal affairs, mainly in a sovereign issue and calls for the necessity of unifying efforts to support a political process based on dialogue, the participation of all Syrian sides without exception and halting violence, ” he added. Minister al-Zoubi said “Doha coalition is a political gathering that has been already existed and reproduced and its members are the same who had formed Istanbul Council. He added that the Syrian opposition abroad, including Doha coalition don’t behave in Syria’s interest because pursuing the path of violence, rejecting dialogue and adopting foreign agendas mean that the opposition has no political project. The Minister underlined that the formation of the so-called military councils for the armed groups will only lead to more violence, killing and destruction.